New Zealand and New Caledonia both sit on the (largely) submerged continent Zealandia, which separated from Australia and the rest of Gondwana some 60-80 million years ago. Both New Caledonia and New Zealand are regarded as biodiversity hotspots. 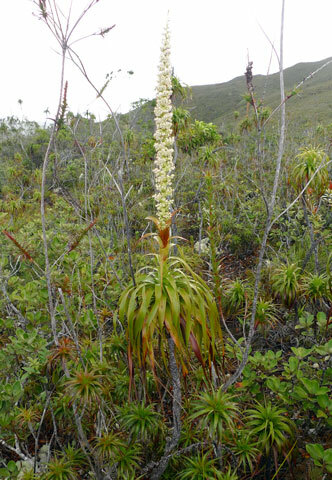 However, New Caledonia, despite a land area less than 10% of New Zealand’s, has far more species of indigenous vascular plants (very approximately 3300 cf. c. 2500). This probably reflects New Caledonia’s tropical setting; tropical areas generally have more species than temperate areas. 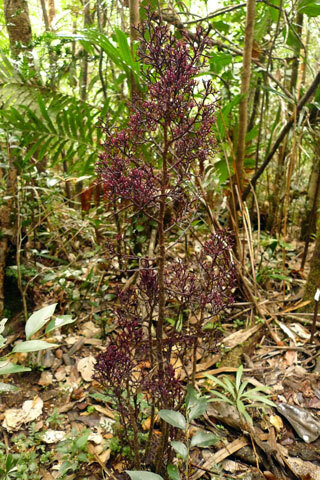 Endemism, where organisms are restricted to a particular area, is high for both New Caledonia and New Zealand, at about 75-80% amongst indigenous seed plants. 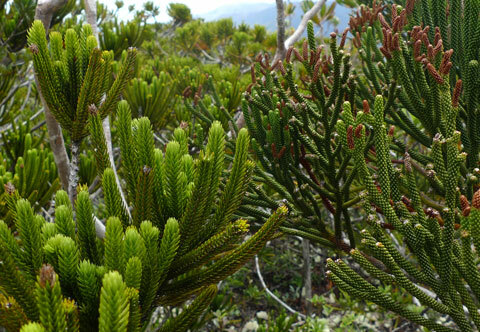 A large portion of New Zealand’s indigenous plants are found in its alpine zone. 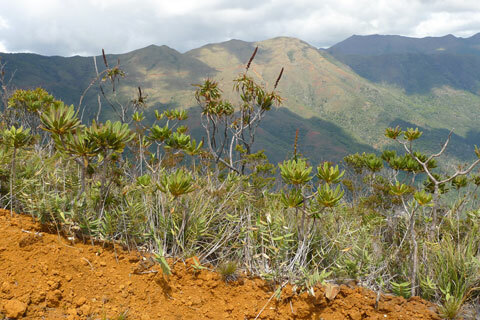 New Caledonia has no alpine zone, but it does have very different rock types which support very different plant communities. 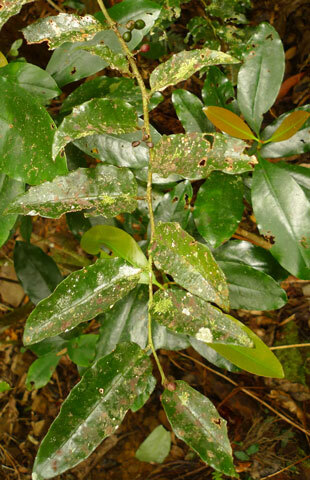 Amborella trichopoda is a rather unprepossessing shrub to look at. In fact, with its leaves often smothered by bryophytes, it’s rather scungy. However, it fascinates botanists because it is the most distantly related of all living flowering plants, at least according to some evolutionary analyses. It is only found in New Caledonia. Photo Leon Perrie. © Te Papa. Wikipedia’s page on Amborella trichopoda. By contrast, Parasititaxus usta is freakily striking, indeed alien-like. 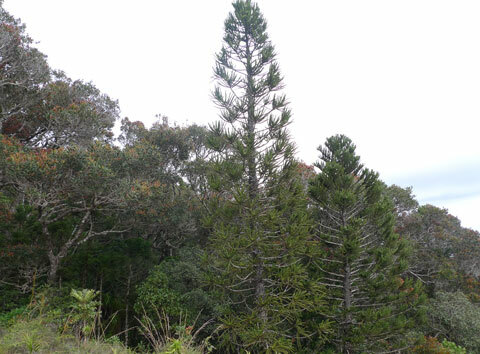 Also only found in New Caledonia, it is the world’s only parasitic conifer, and has no need for green chlorophyll. 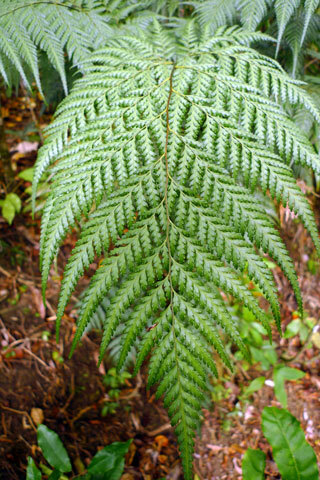 It belongs to the podocarp family, along with the likes of New Zealand’s rimu and totara. Photo Leon Perrie. © Te Papa. Wikipedia’s page on Parasititaxus usta. New Caledonia is renowned for its abundance of araucarians: Araucaria and Agathis. They seem to be nearly everywhere. In this picture is, I believe, Araucaria montana, near the summit of Mont Do and surrounded by Nothofagus/beech. Photo Leon Perrie. © Te Papa. I’ve seen a lot of New Zealand’s magnificent kauri, Agathis australis, so it was fascinating to see some of the diversity of Agathis in New Caledonia. Many New Caledonian Agathis also appear to be known as kauri (or kaori). 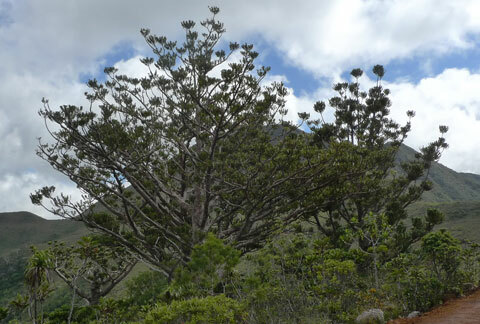 The Agathis species on Mount Panie, known as Dayu Biik (not pictured), is subject to dieback similar to that being experienced by the New Zealand kauri. Photo Leon Perrie. © Te Papa. The New Zealand kauri dieback website. Even some of the other plants look like araucarians. These Araucariaceae mimics are: at left, the cedar Neocallitropsis pancheri, in the Cupressaceae, and; at right, a species of Dacrydium, with male cones, in the Podocarpaceae, and a reasonably close relative of New Zealand’s rimu! Photo Leon Perrie. © Te Papa. 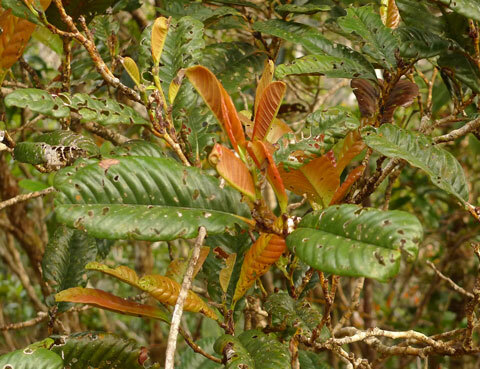 The Nothofagus, or southern beeches, in New Caledonia belong to a tropical sub-group, and do not look anything like the species in New Zealand. Photo Leon Perrie. © Te Papa. Mountainous (sub-?) 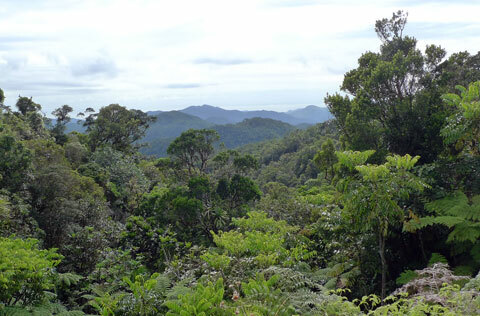 tropical rainforest abounds in some parts. This is Aoupinie. Photo Leon Perrie. © Te Papa. Short, shrubby vegetation, called maquis, dominates large areas, especially in the south on the serpentine soils. This is Dzumac. Photo Leon Perrie. © Te Papa. Dracophyllum verticillatum in flower in the maquis vegetation beside the road up Mont Do. Dracophyllum species only occur in New Caledonia, Australia, and New Zealand. Thanks to Phil Garnock-Jones for the species identification. Photo Leon Perrie. © Te Papa. 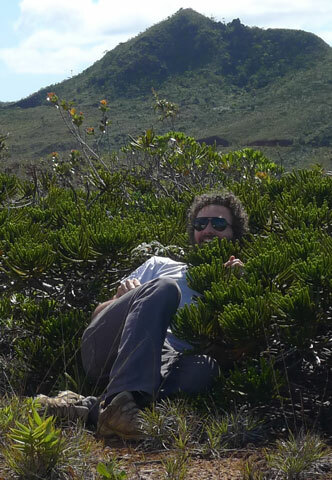 Juan embracing the Lilliputian conifer ‘trees’ of the maquis vegetation. These are Neocallitropsis pancheri, at Montagne Des Sources. Photo Leon Perrie. © Te Papa. As I knelt to collect a fern, I was stunned to find myself surrounded by pitcher plants, Nepenthes vieillardii. 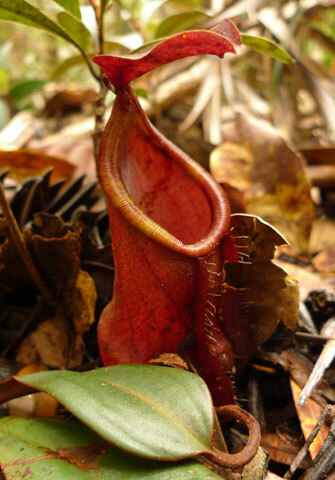 The ‘pitchers’ are traps for catching insects. Photo Leon Perrie. © Te Papa. The large areas covered by Melaleuca trees are very reminiscent of Australia. 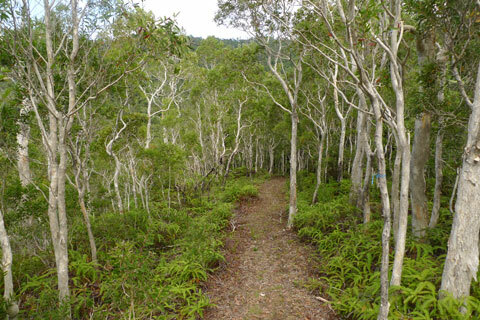 But they are also testament to one of the major threats to New Caledonia’s vegetation – fire. The fern Dicranopteris linearis flourishes amongst the Melaleuca regeneration. Photo Leon Perrie. © Te Papa. New Caledonia has a higher GDP per capita than New Zealand, principally due to nickel and copper mining. Mining operations are widely evident. Photo Leon Perrie. © Te Papa. 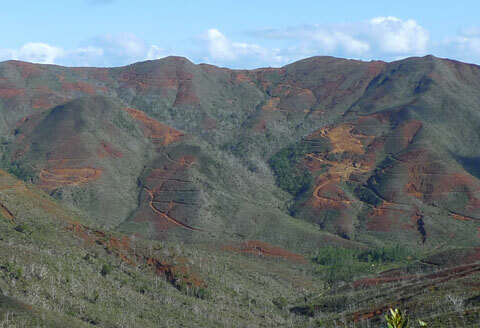 Another threat to New Caledonia’s vegetation is browsing by introduced deer and pigs. Conservation International are trialling using the amount of browse on the fern Orthiopteris firma to monitor the effectiveness of animal control projects. Photo Leon Perrie. © Te Papa. I am an Asst. Professor in the Dept. of Botany, NSS College, Pandalam, Kerala University, South India. I am writing a guide book for students in Ferns. Purely for academic purpose, not for pocket or buisiness purpose. For that, may l use the image of Orthiopteris given in this website. You will be properly acknowledged and credit of the image will be given in the name of this website. Kindly give permission to use the image. Anticipating swift response at your earliest. Beautiful pictures and a fascinating country. Thank you.